Like most Pennsylvania towns, Salisbury has a long history. First founded in 1794, the town is home to nearly 900 people today. Its rich history can be seen everywhere, from downtown and Grant Street to the many side roads with family homes on them. No matter where within the Salisbury or Somerset County region your house is located, it likely experiences the kind of wet summers and winters that the state regularly receives. Average lows here hover in the low 20s throughout the winter, and 3 to 5 inches of precipitation are the norm. That weather means that your home needs to be in top condition, and that it needs to be able to stand up to the moisture that Mother Nature throws at it. Basement waterproofing Salisbury homes is the key to doing just that, and a vital step for any homeowner in the area to take. One thing worth pointing out is that basement waterproofing Salisbury homes is incredibly important due to those freezing temperatures we experience during the winter months. 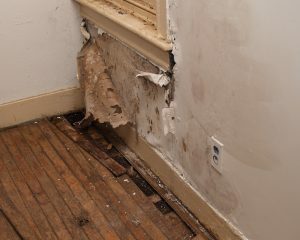 As moisture finds its way into cracks in foundation walls, it will expand when it freezes. Once it thaws, the cracks will be left larger than before. And as the spring thaw starts, even more moisture moves against the basement walls. Basement waterproofing Salisbury homes is something that provides a number of benefits to homeowners. The obvious one is simply a dry basement or crawlspace, but what does that mean for you and your home? Some of the big benefits include the following. • Increased Property Value – Your home’s liquidity is improved and your investment is protected with waterproofing, improving your loan opportunities and resale potential. • Saved Money – Major repairs on problems stemming from leaking basements can be far more expensive than the cost of basement waterproofing Salisbury homes. As such, you save yourself money in the long run. • Improved Health – Mold growth can lead to numerous health issues, but waterproofing helps protect your family from this issue. • Peace of Mind – Just knowing that your home is protected from leaking basements and other issues means that you can rest easy at night knowing your home is safe from moisture related problems. Each of these steps can be involved in the process, and in many cases more than one will be combined to create a total solution for your home’s basement. Our team can help you identify which steps are the right ones to take, and ensure that you get the results you deserve. Does Your Home Need Waterproofing? There are several key signs that your home may need basement waterproofing. Here are the main things to consider. • Water – If you see obvious pools of water or moisture on the walls, it’s a clear indicator that you need to call our team as soon as possible. • Dark Spots – Some moisture may not make it all the way through as you would expect. Dark areas on concrete or cinder block walls or floors mean that moisture is heavy within the cement, which in turn means that it’s finding its way into the home. • Mold – Mold growth is a sign that moisture levels are too high in the basement. This in turn means that you need to stop the problem quickly – and remove the mold. • Odor – Moldy, damp smells can tell you a leaking basement is a problem before you ever see actual water. • Timeline – If your home hasn’t had basement waterproofing performed on it in the past several years, or if you’re unsure of just when its last waterproofing occurred, it may be worth having our team do an inspection to ensure that there is no real problem. If your home has any of these symptoms, it’s in your best interests to consider contacting us for your free inspection and waterproofing estimate. It will be one of the smartest investments in your home’s future that you ever make.